The Town House was built in 1828 and served as municipal offices, school, jail and community center. 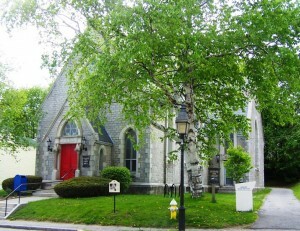 Sunday School programs were offered here as well as concerts, dances, roller skating and other events. 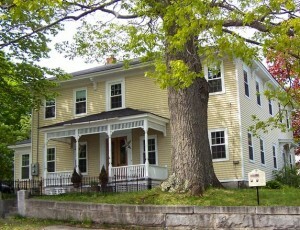 The Hallowell Lyceum, an education and entertainment forum, met here. In 1832, citizens heard a lecture by Mr. Merrick on a new invention, the steam engine. In 1853 lectures were delivered by Ralph Waldo Emerson, Wendell Phillips, Oliver Wendell Holmes, Richard Henry Dana and women’s rights advocate, Lucy Stone. 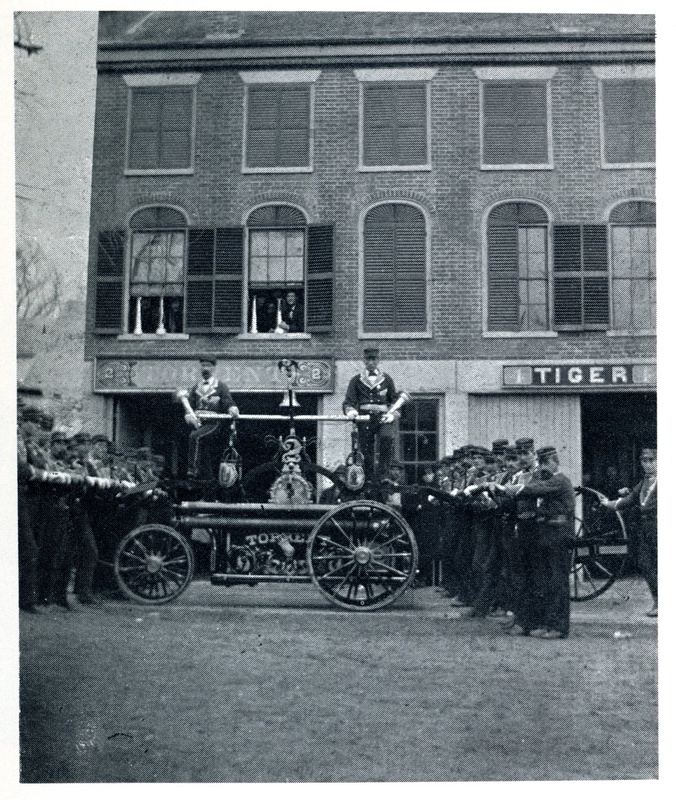 After the City Hall was built in 1898 the Fire Department moved here and has served the community at this location ever since. It boasts one of the finest collections of antique fire fighting equipment in Maine. Town House fut érigé en 1828 et servit de mairie, école, prison, et centre communautaire. On y faisait l’école du dimanche, des concerts, bals, du patinage à roulettes et autres activités. Le Hallowell Lyceum, un groupe destiné à instruire et distraire la population, se réunissait ici. En 1832, les citoyens assistèrent à une présentation de M. Merrick sur une nouvelle innovation, la locomotive à vapeur. En 1853 Ralph Waldo Emerson, Wendell Phillips, Oliver Wendell Holmes, Richard Henry Dana et la féministe Lucy Stone y firent des conférences. Après la construction de l’Hôtel de Ville en 1898, la caserne des pompiers s’y installa et continue à servir la population locale. Elle abrite l’une des meilleures collections du Maine d’équipement ancien contre l’incendie. The Hallowell Museum in the Streets is a project of Row House Inc. and the Hallowell Area Board of Trade, made possible by Patron Grants from Gardiner Savings Bank of Maine, Mattson Development, LLC and The Wolfington Auto Group. 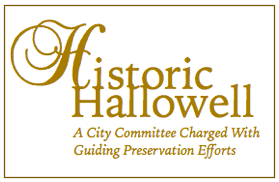 The project was underwritten by Hattie’s Chowder House. 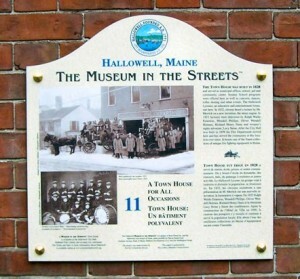 Location: Union and Second St.
Women in 19th Century Hallowell didn’t have the vote or a presence in many of the professions but they did wield power and influence. 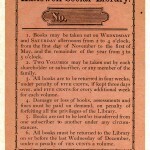 In 1868 they began to raise funds for the purchase of property and the construction of a library. In 1880 their dreams were realized when this, the first public library building in the State of Maine, was erected. Designed by A.C. Currier and built with granite donated by the Bodwell Granite Company, it is often mistaken for a chapel or church. Gifts from Gen. Thomas Hubbard and Eliza Clark Lowell added two graceful wings to the original design. prompting admirers to label it “The Jewel of Second Street.” In November of 1937 a train derailment seriously damaged the building but it was rebuilt to its original beauty. Les femmes au 19ème siècle n’avaient ni droit de vote ni accès à de nombreuses professions mais elles ne manquaient pas de pouvoir ou d’influence. En 1868, elles commencèrent à rassembler des fonds pour l’acquisition d’un terrain et la construction d’une bibliothèque. En 1880, leur rêve se réalisa avec la construction de cette bibliothèque publique, la première du Maine. Conçue par A. C. Currier et bâtie en granit offert par la Bodwell Granite Company, on la confond souvent avec une chapelle ou une église. Grâce aux dons du Gén. Thomas Hubbard et Eliza Clark Lowell, on put ajouter deux ailes gracieuses au plan original, ce qui lui donna la réputation de “Bijou de la Deuxième Rue.” En novembre 1937, un déraillement ferroviaire endommagea gravement le bâtiment mais on le reconstruisit dans toute sa beauté. Location: Union St. in front of old Hallowell Granite office (Brahms/Mount) Union St.
Hallowell’s high quality white granite was prized at an early date as material for public monuments and statuary and orders were filled for cities throughout the United States. The statue “Faith” atop the National Monument to the Forefathers at Plymouth, Massachusetts, was sculpted at Hallowell. Many of the public buildings in New York City, including the Hall of Records and the Metropolitan Art Museum, were built using Hallowell Granite. The Marshall Field Building and the Post Office in Chicago, Ill. were large contracts, but the largest single contract was with the State of New York for the State Capitol at Albany, from 1867-1898, which totaled 25 million dollars. Le granit blanc de haute qualité de Hallowell fut vite prisé pour la construction de monuments publics et de statues. On remplissait des commandes pour tous les Etats-Unis. La statue Faith au sommet du Monument National qui célèbre les premiers arrivants à Plymouth, Massachussetts, fut sculptée à Hallowell. Beaucoup de bâtiments publics à New York, comme le Hall of Records et le Musée d’Art Métropolitain furent bâtis avec le granit de Hallowell. Le bâtiment de Marshall Field et la Poste à Chicago, Illinois, représentaient des contrats importants, mais le plus gros fut signé avec l’état de New York pour le Capitole à Albany, de 1867 à 1898, pour 25 millions de dollars. Chargement de statues à expédier. 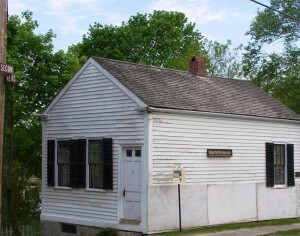 Bureaux de Hallowell Granite Works. The project was underwritten by Vallee Real Estate. 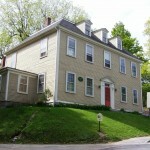 Dr Hubbard House Second St.
Dr. John Hubbard Junior started practicing medicine in Hallowell in 1830. He graduated from Dartmouth College and the Medical Department of the University of Pennsylvania in Philadelphia. The building, an authentic nineteenth century doctor’s office, was closed on his death in 1869 and remained on the Hubbard Farm until being moved to here in 1989. Dr. Hubbard served as the governor of Maine in the early 1850’s, signing the “Maine Law” for the “Suppression of Drinking Houses and Tippling Shops” making Maine the first in the nation to enact prohibition. 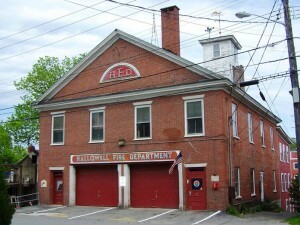 His family continued to contribute to Hallowell after his death . 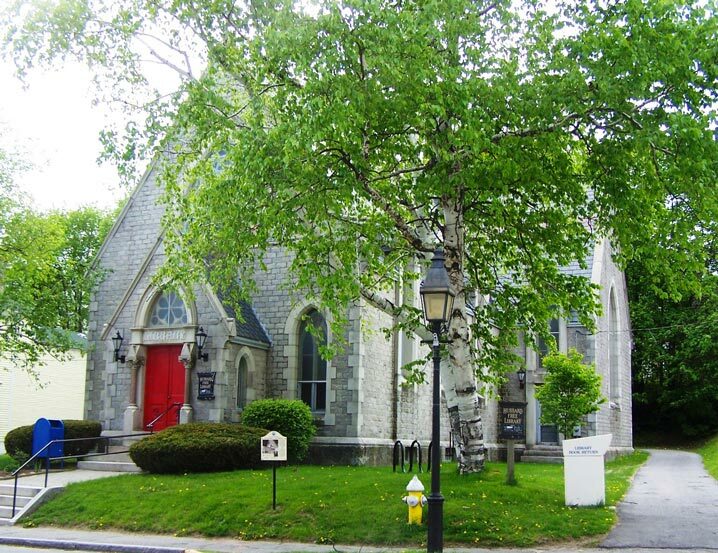 Son Thomas, a graduate of Bowdoin College and a successful New York railroad lawyer, donated the first addition to what is now the Hubbard Free Library in 1893. Dr. John Hubbard Junior s’établit comme médecin à Hallowell en 1830. Il avait fait ses études à Dartmouth College et sa médecine à l’Université de Pennsylvanie à Philadelphie. Le bâtiment, un cabinet médical authentique du dix-neuvième siècle, fut fermé à sa mort en 1869 et resta à la ferme Hubbard jusqu’à son transport ici en 1989. Dr. Hubbard fut Gouverneur du Maine au début des années 1850 et signa une loi, la Maine Law, pour la suppression des tavernes et magasins de boisson qui fit du Maine le premier état du pays à appliquer la prohibition. Sa famille continua à contribuer à Hallowell après sa mort. Son fils Thomas, diplômé de Bowdoin College et avocat prospère pour les chemins de fer de New York, offrit en 1893 une nouvelle aile à la bibliothèque qui porte aujourd’hui son nom. Les instruments du Dr. Hubbard. 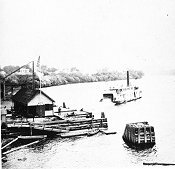 The steamer Della Collins leaves the Eastern Steamship dock in Hallowell bound for Augusta. The rapids in Augusta that mark the “head of tide” made Hallowell the last port on the Kennebec able to accommodate larger ocean-going ships. By 1810 thirteen major wharves lined the riverbank, some extending more than 50 feet out into the river. 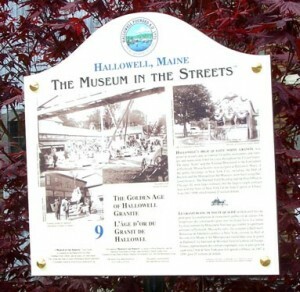 Hallowell fast became a major transportation hub for all of central Maine. 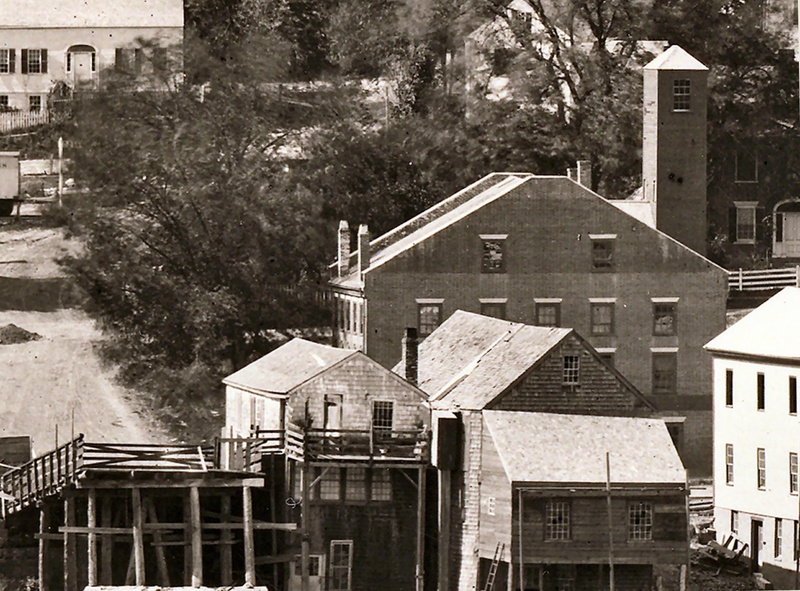 Large warehouses stored the goods that awaited shipment on the Coos Trail (Winthrop Street) and the Canada Road (Route 201). As early as 1794 brigs, schooners and sloops as well as small passenger ships called “packets” provided regular service to Boston. 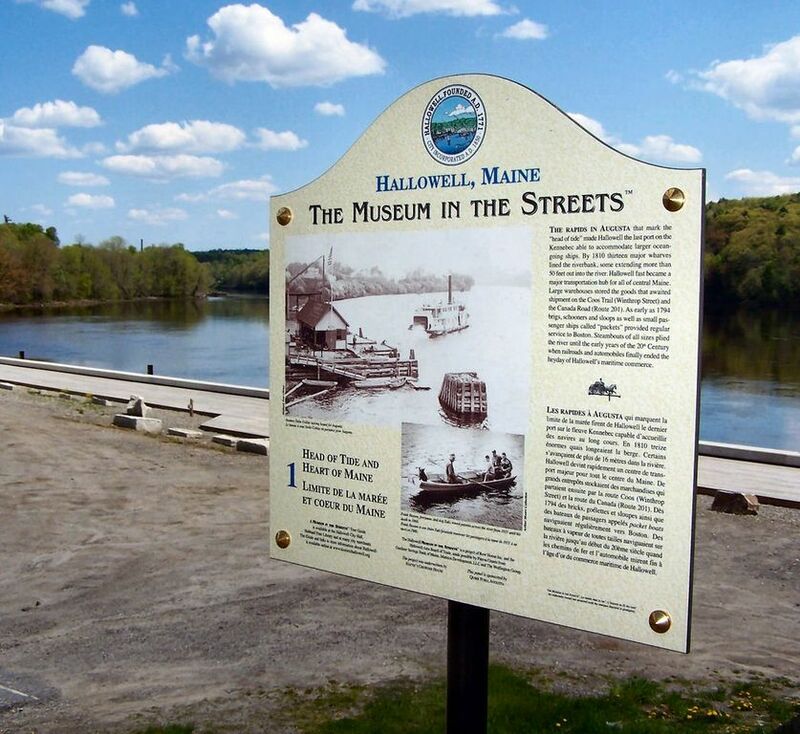 Steamboats of all sizes plied the river until the early years of the 20th Century when railroads and automobiles finally ended the heyday of Hallowell’s maritime commerce. 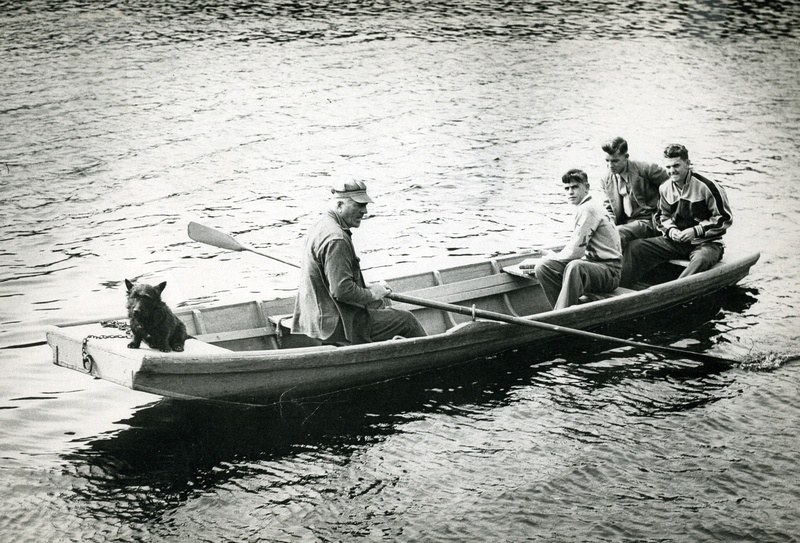 Frank Nassen, ferryman, and dog Zuki, rowed patrons across the river from 1931 until his death in 1960. Location: Valle Real Estate Building Winthrop and Water St.
James Ingraham’s residence and grocery store occupied this site in the early 1800’s. It was a favorite gathering spot for the men in town and famous for its stock of rum and fine wines. 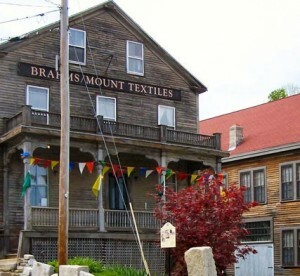 Both the home and the business were destroyed in the Great Fire of 1826. City Hall stands today where the residence was located. 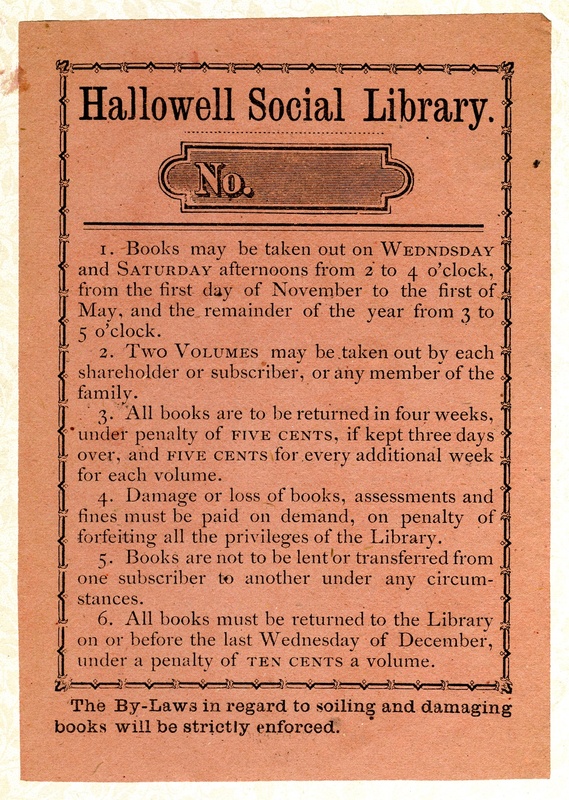 Faceplate of Hallowell’s first library. 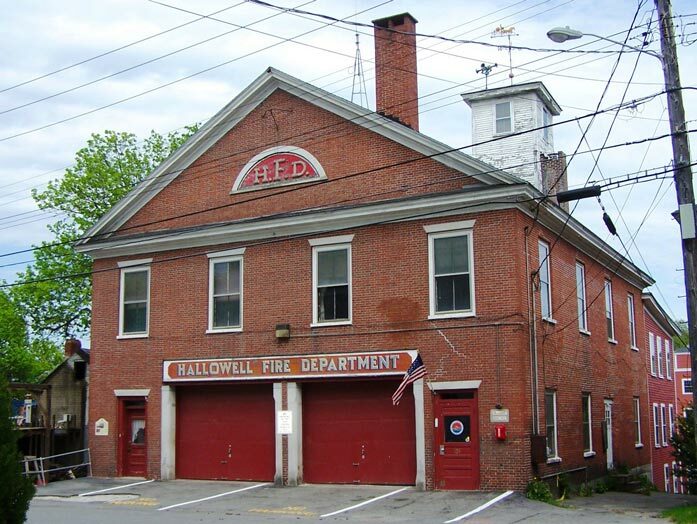 This present brick building was built the same year and has since housed a hardware business, the American Advocate newspaper, the Hallowell Social Library, the City fire station and the lodge of the International Order of Odd Fellows. The son of James Ingraham, Rev. J.H. 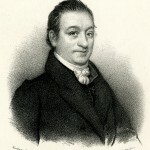 Ingraham, was a popular 19th Century writer who wrote novels with biblical themes. He was one of the first American writers to sell over a million copies of his work. 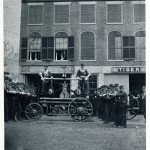 Fire Company with hose tower. The project was underwritten Vallee Real Estate. 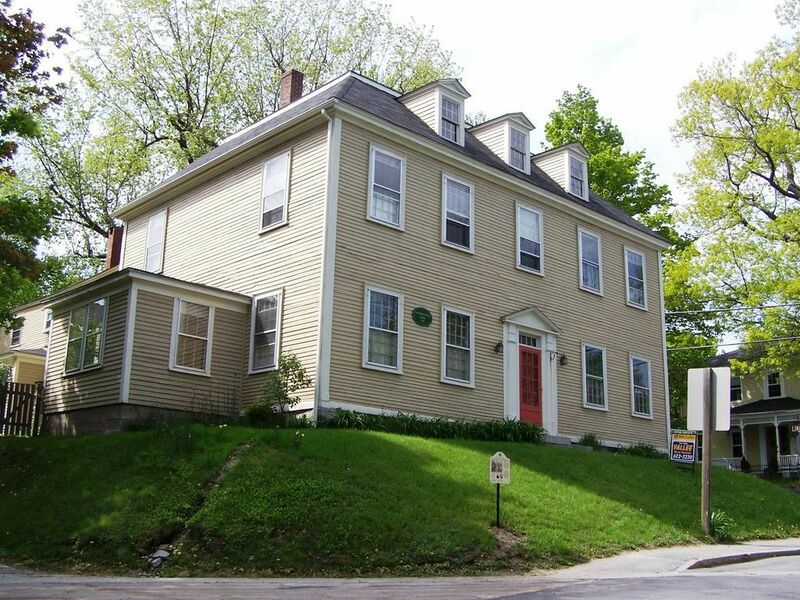 Dr.Benjamin Page, one of the first physicians to practice medicine in Hallowell, lived here. Dr. 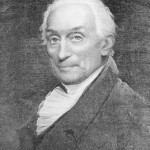 Page was an associate of Dr. Benjamin Vaughan who followed discoveries in science and medicine. 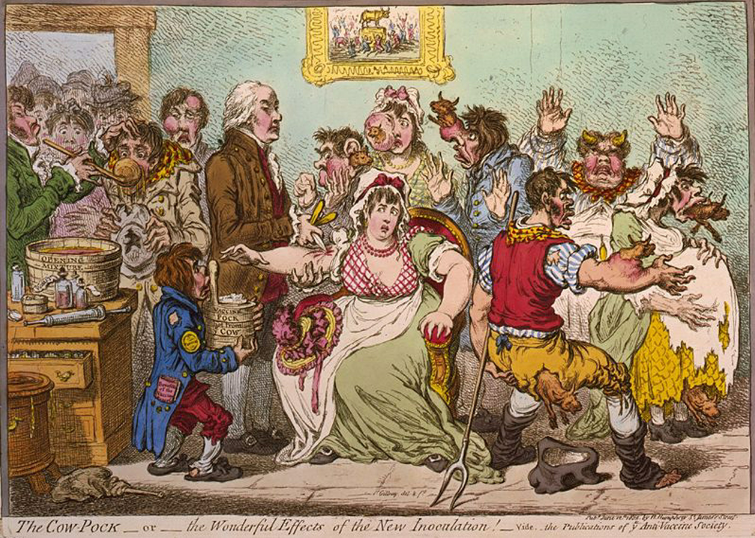 Dr. Vaughan learned of the successful experiments of London surgeon Dr. Edward Jenner in developing a vaccine against smallpox. In 1800, Dr. Vaughan obtained samples of the vaccine from Dr. Jenner and provided them to Dr. 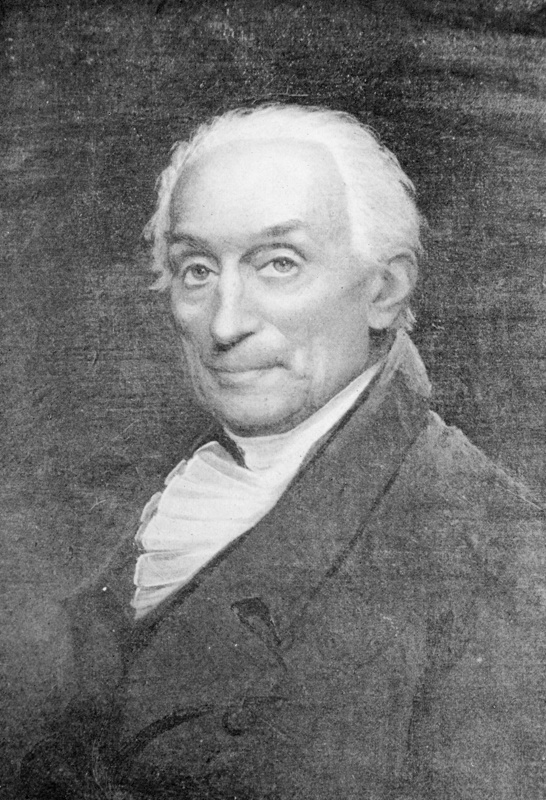 Page, who administered them here in one of the first field trials of an experimental vaccine in the history of American medicine. Results were reported to Jenner in London and helped win Parliamentary approval for widespread distribution of the vaccine. Dr. Vaughan did not practice medicine, but collaborated with Dr. 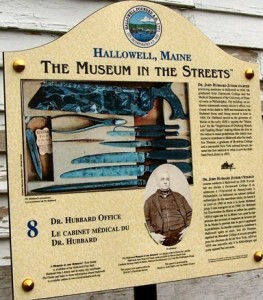 Page assisting when a yellow fever epidemic threatened Hallowell. 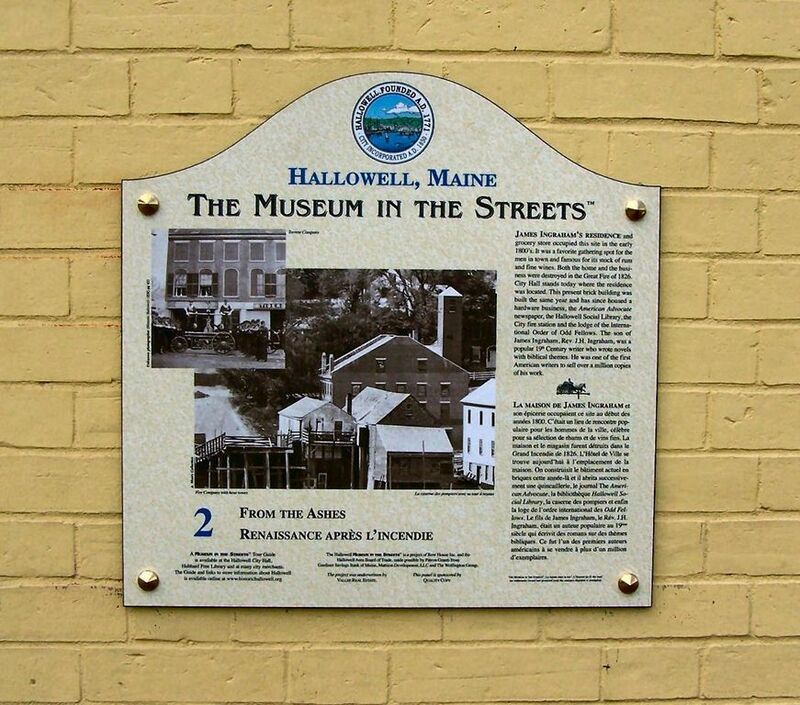 The Hallowell Museum in the Streets is a project of Row House Inc. and the Hallowell Area Board of Trade, made possible by Patron Grants from Gardiner Savings Bank of Maine, Mattson Development, LLC and The Wolfington Group. Ebenezer Dole House Second and Lincoln Sts. Ebenezer Dole, his brother Daniel and others, met here on November 18, 1833 and formed the first anti-slavery society in Maine known as The Hallowell Anti-Slavery Society. 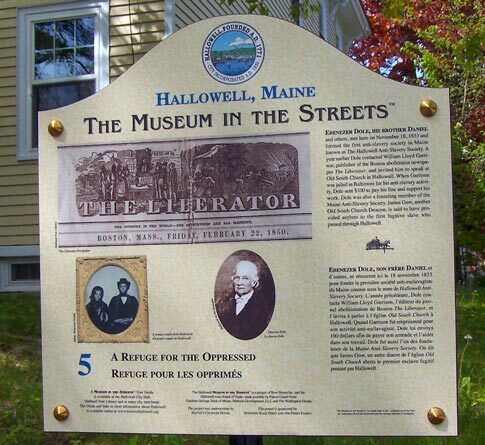 A year earlier Dole contacted William Lloyd Garrison, publisher of the Boston abolitionist newspaper The Liberator, and invited him to speak at Old South Church in Hallowell. When Garrison was jailed in Baltimore for his anti-slavery activity, Dole sent $100 to pay his fine and support his work. Dole was also a founding member of the Maine Anti-Slavery Society. 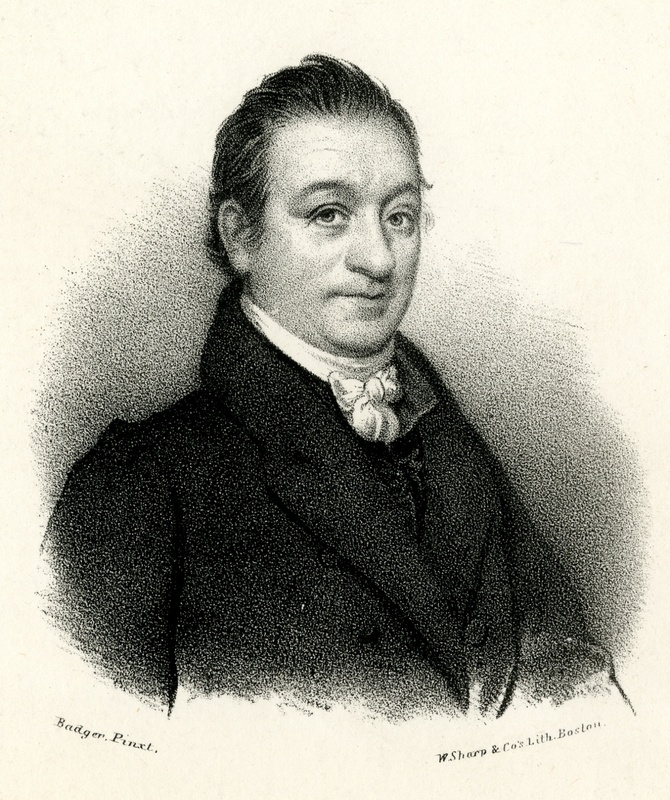 James Gow, another Old South Church Deacon, is said to have provided asylum to the first fugitive slave who passed through Hallowell. Ebenezer Dole, son frère Daniel et d’autres, se réunirent ici le 18 novembre 1833 pour fonder la première société anti-esclavagiste du Maine connue sous le nom de Hallowell Anti-Slavery Society. L’année précédente, Dole contacta William Lloyd Garrison, l’éditeur du journal abolitionniste de Boston The Liberator, et l’invita à parler à l’église Old South Church à Hallowell. Quand Garrison fut emprisonné pour son activité anti-esclavagiste, Dole lui envoya 100 dollars afin de payer son amende et l’aider dans son travail. Dole fut aussi l’un des fondateurs de la Maine Anti-Slavery Society. 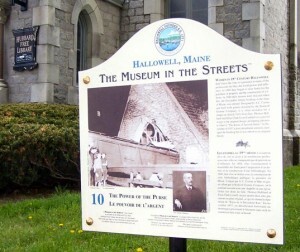 On dit que James Gow, un autre diacre de l’église Old South Church abrita le premier esclave fugitif passant par Hallowell.